Arugula (also known as Eruca sativa, rocket salad, rucola, and rugula), is an edible plant that is often used in salads. The leaves are longish, and have four to ten small sideways lobes with a large station lobe. The young and tender leaves have a sweet flavor and are less peppery than the strong spicy flavor of the more mature leaves. Arugula is rich in vitamins A, C, E and K, and various B vitamins such as thiamin, riboflavin, niacin, vitamin B-6, and pantothenic acid. The leaves contain plenty of minerals, especially copper and iron. It also has trace amounts of some other essential minerals and electrolytes such as calcium, iron, manganese, magnesium, phosphorus, potassium, selenium, and zinc. Anti-cancer: Arugula is rich in phytochemicals such as indoles, thiocyanates, sulforaphane, and isothiocyanates. These phytochemicals can potentially counter carcinogenic properties of estrogen and can help protect against breast, cervical, colon, ovarian and prostate cancers because of the cytotoxic effects on cancer cells. The high content of vitamin A and beta-carotene protects from cancers of the skin, lungs and oral cavity. Antioxidant: High antioxidant levels create a healthy balance of enzyme response within cells. It also finds and kills off disease-causing free radicals that cause damage to the body. It builds your immunity and increase your defense against ailments like the common cold and other virus. Bone health: Arugula is rich in vitamin K which is an antioxidant that has anti-inflammatory properties and encourages osteotrophic activities in the cells. This means that it supports healthy bones and strengthens them. Patients suffering from osteoporosis may benefit from consuming arugula and it can also be used to develop bone strength and health. Brain health: One of the functions of vitamin K in arugula helps to regulate calcium in the brain. It may be helpful to reverse neuronal damage in the brain and help improve brain health. Digestion, improve: The bitter taste of arugula leaves are helpful for improving digestion in individuals who suffer from chronic indigestion due to low stomach acid. Eating a few leaves 15 minutes before a meal may help improve bile production that aids digestion. Immunity: Fresh arugula leaves have high content of vitamin C which is a powerful, natural antioxidant. Vitamin C rich foods help protect the body from diseases, developing resistance against infectious agents, and neutralize free radicals in the body. 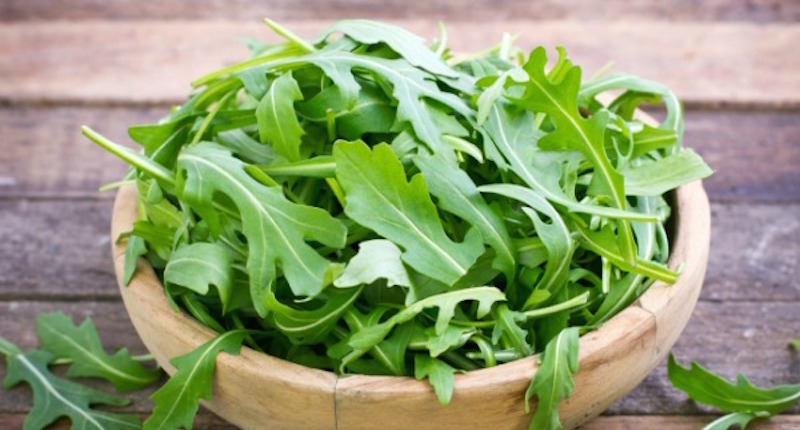 Neural tube defects, prevent: Fresh arugula is an excellent source of folate and when consumed by a woman during the time of conception and throughout pregnancy, may help prevent neural tube defects in the newborn child. Vision Health: Carotenoids content in these bitter leaves are important for improving a person’s eyesight; they also slow down the development of macular degeneration, which is what happens when a person’s area of vision becomes compromised. The increased amount of carotenoids in a person’s diet may slow down the classic symptoms of old age. 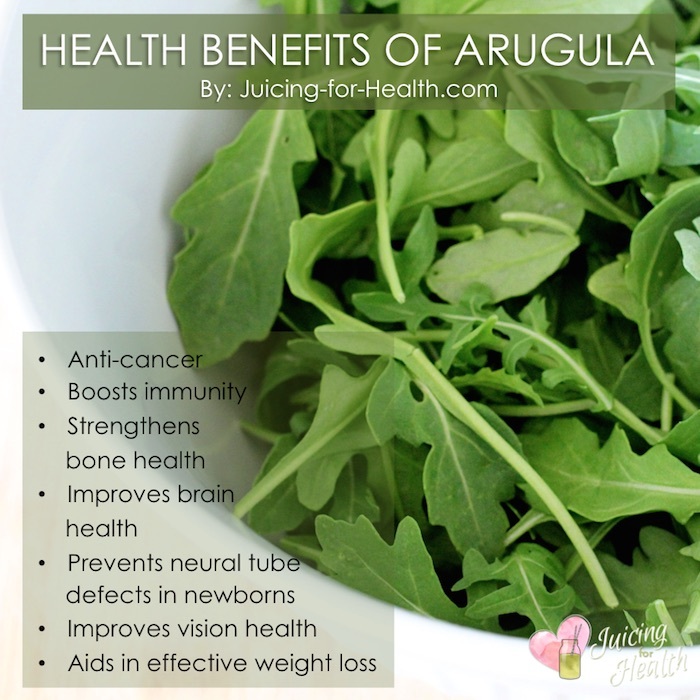 Weight Loss: Arugula is a low-calorie, vitamin rich plant, and will have a great effect on weight loss diets. The nutritional content of arugula is an excellent way to keep your system balanced, and you will not have to make extreme changes in your diet. Choose crispy green young leaves for adding into salad. The older leaves are usually used in cooking. Arugula can be juiced along with your other greens, or mixed with fruits or vegetables to be blended into a smoothie. Store arugula in the crisper drawer of your refrigerator set at high humidity. Arugula has a high content of oxalic acid. If you have a history of kidney problems, it is recommended that you only eat it sparingly.